Check your label. Chances are you’re wearing something made somewhere else. 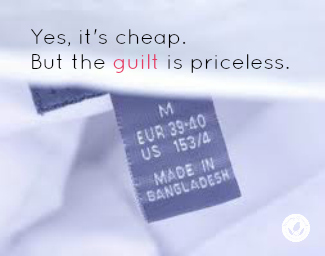 That’s because so-called “fast fashion” has outsourced the $3 trillion a year apparel industry to countries like Bangladesh and China, which underpays its workers and allow some of the most dangerous, toxic—and least expensive—means of production in order to provide the American consumer with cheap and disposable goods. A garment factory building fire that killed more than 900 people in Bangladesh has the industry calling for better regulation of fast fashion. Yet as of today, GAP is still refusing to sign a safety agreement that would require companies to conduct fire and building safety inspections and make the findings public. When it comes to the environmental and social impact of fast fashion, America is downwind. Why does fast fashion matter? Economically, it’s bad business: Government statistics show that since 2002, China’s textile and apparel imports to the United States have increased 263 percent while the textile sector in the U.S. lost 433,000 jobs. According to Save the Garment Center, less than five percent of clothing sold in the U.S. is made here, compared with 95% in 1960. Environmentally, it’s worse. According to the Natural Resources Defense Council, when it comes to environmental pollutants in our air and water, the United States is directly in China’s line of fire. “Scientists estimate that thirty percent of California’s particulate air pollution comes from across the Pacific,” said Linda Greer, director of the Health Program at NRDC and creator of its Clean by Design program. “China’s textile industry’s contribution to this soot is more than three billion tons per year [causing] cities across America to be in violation of air quality standards. Greer’s Clean by Design has set its sights on cleaning up the Chinese fast fashion industry by establishing business practices that reduce water pollution and energy use to help plants run more efficiently. The logic behind this program, as well as the Currency Reform for Fair Trade Act, is that if multi-national companies such as Walmart, H&M, Gap, Levi and Nike—all participating in Clean by Design—won’t pull out, then manufacturing in China must become more like that which takes place in the United States, with accurate currency valuation, fair wages for workers and environmentally conscious manufacturing. By enforcing these practices, the cost of doing business in China becomes more competitive. And manufacturing starts to come home. What can you do in the mean time about fast fashion? Think slow. Just like the slow food movement, slow fashion is about buying clothing made in a sustainable way—typically, these designers are working locally to produce smaller quantities of goods. And look for fair trade manufacturers who typically work in third-world countries to forge economic partnerships that can alleviate poverty, reduce inequality, and create opportunities for farmers and artisans. Finally, think long and hard before you purchase. If you really love something, go for it. But if you just want a shopping fix, try swapping or thrifting—and make that fast fashion last. What’s up, I read your blog daily. Your writing style is witty, keep it up! Fantastic article! I work for Baabaazuzu–an eco-fashion house base in Michigan. I love your use of “slow fashion”–first time I’ve heard of the term. We use the term upcycling, because our clothing is created from salvaged garments (it’s pretty rewarding to work for a clothing and fashion accessories brand who handcrafts repurposed goods in the USA). Thank you again for this write up. I’d love to mention it in our monthly newsletter–I would certainly link back to Mommy Greenest–is that ok? Green on! I think you said it best when you compared clothes purchasing to the SLOW food movement. There’s no reason to stock your closet with excessive clothing that will only last a season and then be haphazardly discarded. For our two children we use 90% hand me downs, and purchase only organic pj’s and undies. My wardrobe is more about investing in things I’ll love and wear and are timeless. I use accessories to keep up with trends I’m interested in. For dress items, or special items, I only shop vintage or consignment. I also try to make Eco friendly purchases and participate in swaps. My hubby’s closet needs the most work, but at least he wears his clothes until they cannot be worn ANYMORE! I agree that we have a lot of purchasing power and we are making it our priority to put our money where our hearts (and mouths) are. Great and informative article! I completely agree with you on what I wear and what my husband wears–to threads 🙂 But for my kids it’s hard, my middle daughter especially. She likes thrift shopping with me, but she also wants to shop at Forever 21. Sigh. At least she knows about fair trade and fast clothing and how F21 plays into that, because I tell her, but I also don’t forbid it. I know that would make her just want to shop there more. Hopefully one day she’ll come around!